Orchids grow in great profusion in Normandy including in marginal and untended areas such as along roadside verges (see photos below). Spring and early summer this year  have seen a spectacular showing in many places around our home near Rouen. 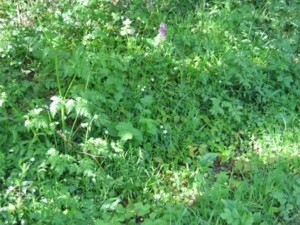 The European wild orchids are smaller and less spectacular than their tropical counterparts. Nevertheless they are extremely interesting: some are very beautiful, some are sweet-smelling, and many have curious interactions with other living species (such as bumble-bees or other plants or fungi). It seems important to conserve them in (with) their natural habitat. Their presence is often overlooked by people although they grow in large numbers in wild undisturbed and rather nondescript areas. People (and organisations such as companies or local communities) want to get these areas "under control" - mowing them very short at inappropriate times or spraying chemicals until there is nothing left but short sterile lawn with a few species of "weeds" such as dandelions, daisies, chickweed, and so on. For instance, a few days after I took the photographs below, the road edge was mown flat. This orchid certainly did not have time to set seed in 2005 - hopefully the bulb will still be present and viable next year [* see '2006' below].